Though today the number of practicing Zoroastrians is practically microscopic, the Zoroastrian religion is uniquely well-documented. Sources have come down to us in a variety of different languages relating to the Zoroastrian religion, ranging from Elamite to Japanese, from Greek to Geʼez. 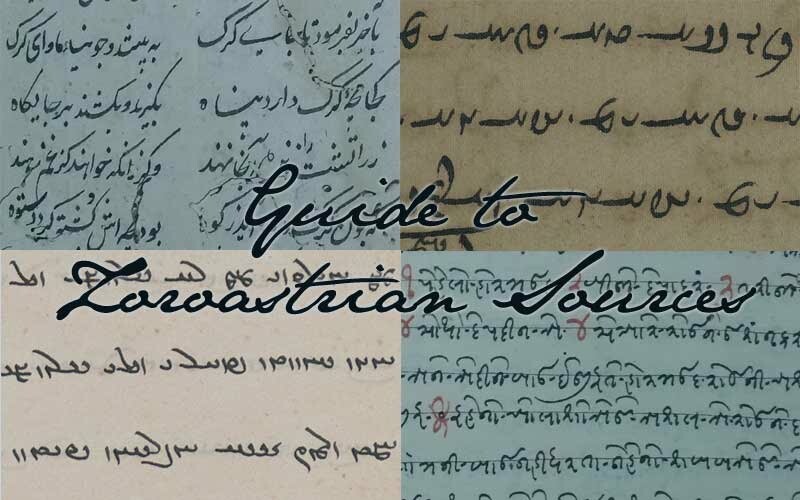 This Guide is intended as a bibliographical resource for scholars working on Zoroastrian literature, that is, texts composed by people who identified or probably identified themselves as Zoroastrians. In the coming months, I hope to provide a somewhat exhaustive sketch of the works and genres that this literature comprises, providing where possible existing bibliographical and codicological references, as well as excerpts and translations from selected texts. Avestan (coming soon): the language of ancient texts composed orally, at some point crystallized to accompany certain rituals, and eventually written down during the Sasanian era as the Avesta. Middle Persian (Book Pahlavi) (coming soon): one of the languages of the Sasanian Empire, used for a variety of religious texts which reached their final redactions in the 9th century, continued to be used sporadically as a scholarly language among priests until the 19th century. Persian (New Persian, Classical Persian, Modern Persian): the dominant language of Iran as it developed after the coming of Islam and as it continues to the present. The earliest extant texts by Iranian Zoroastrians begin around the 13th century. Persian became a lingua franca and language of learning in India (Indo-Persian) as well as Iran, and began to be used by Indian Zoroastrians in the early 15th century. Gujarati: the language of the area of western India where the Parsis settled. The earliest Parsi Gujarati manuscripts dated to the early 15th century.